Week three of Fall field trips is upon us, and we couldn’t be happier with the way this season is shaping up! 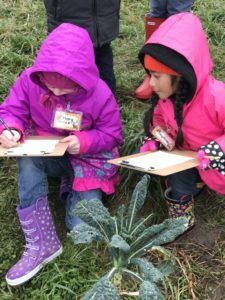 We have a great group of committed staff and enthusiastic volunteers, and together we’ve planted seeds, held worms, and tasted kale with almost 200 Portland students. We also put the students to work in our Grow Lunch Garden! 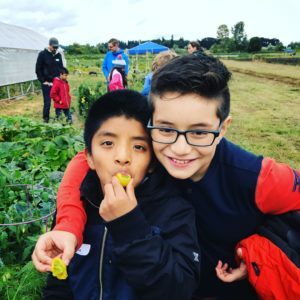 Our Seed to Harvest module is packed full this time of year with tasting lots of fruits and veggies, helping to plant seeds, learning about plant life cycles, and maybe even doing some weeding if we have the time. One of the most exciting moments for many students is realizing that fennel flowers taste like black licorice… telling kids to leave enough fennel for their classmates is a pretty good problem to have. 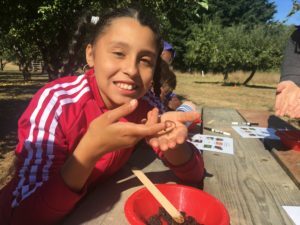 A day at Sauvie Island doesn’t entirely consist of snacking on tomatoes and cucumbers, though – our third Fall season module is Soil and Compost, where kids get to dig through our very own worm bin. It’s pretty magical to see the fascination and respect that students have for our little decomposer friends. After learning about how important worms are to healthy soil, almost all students take the opportunity to carefully hold a worm or two… and usually ask for their picture to be taken with their new friend.